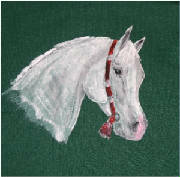 We create wonderful watercolor, stained glass, pencil, tole, fabric painting and other artwork from your photos or ideas. We offer free estimates and guarantee you will be satisfied with the end product. Prices are listed in table below. 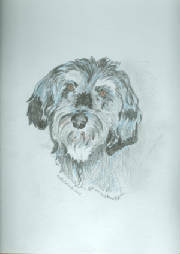 **Note that is is NOT necessary to purchase the original painting/sketch in order to enjoy a print or notecards. Just give me permission to re-use the design in other items. Set of 10 includes address labels and sealing sticker with the same painted design as the card. 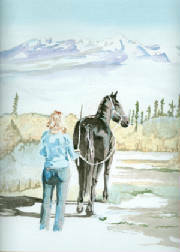 'Bound for the Mountains' Shiloh Velarde driving 'Sid'; watercolor painting created as a composite from several photos.